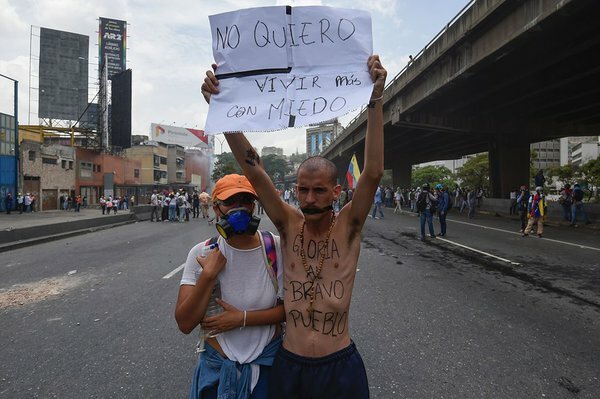 Venezuelan holding a sign that reads (in Spanish) " I don't want to live anymore in fear"
Would you believe it if I told you that Venezuela was one of the richest countries in Latin America? Hard to believe with the current flow of images that flash in front of us like fireworks concerning malnourished infants and citizens savaging for food. But the truth is Venezuela is rich – it has the world's largest deposits of oil in the world. But the issue is that it’s mismanaged, as the country has gone through a downward spiral since the death of former President Hugo Chavez, with the rise of current President Nicolas Maduro to the post. And Maduro has lacked everything that Hugo Chavez was notorious for – mainly charisma and conviction. Since 2014, inflation has risen rapidly leaving food items such as milk becoming a luxury amenity. People queue for hours in the morning just to be able to buy toilet paper – only to despair that it’s already gone by the time they get in. People are become desperate in Caracas – and angry. Kidnappings for cash are just as rampant as the protests against the government, making Caracas more dangerous than Mogadishu or Karachi. At present, there isn’t much that can be done to help Venezuela, except raise awareness to the humanitarian need that’s present. Basic items such as foods and toiletries need to be sent and medicine needs to be secured (as supplies are rapidly depleting). The Venezuelan Government needs to open dialogue with international humanitarian organisation to at least provide the basic care and support to the people during this turbulent times. It’s not for the international community to intervene but it is their duty to assist the people where needed as Venezuela’s problem is one that needs a Venezuelan answer. The key issue though is that the government refuses to acknowledge the humanitarian urgency in the country. Representatives of Maduro and his government have come on the air multiple times asserting that the country is fine and that the crises is “blown out of proportion”. They may feel that is the case but the stories from the ground both from my own contacts and colleagues in Venezuela says otherwise. It is time that the government remove itself from its high horse and admit to needing humanitarian assistance for its people. In doing so, it will save face in the midst of lack of confidence (48% of country prefers the opposition party and it’s growing, while 50% want the president to do something now to fix the economy) and level the frustrations of the citizens that reduce them to resorting to violence and desperate measures (such as eating from garbage dumps in search of food). More importantly, it will ensure the population lives to see the elections scheduled for next year. There’s an expression in Spanish when you are at the tipping point of your anger and where any small action that annoys you can lead to full boil – “ser como agua para chocolate” (to be like water for chocolate). As servants to the county and the struggling population, it is vital the Venezuelan government permit humanitarian aid to offer vital support for its people for if not, the Venezuelan people will not just boil – they’ll explode. Venezuelan-American Comedian Joanna Hausmann gives a brief (and comical) easy-to-understand overview on the background of the crisis and the current frustrations of the Venezuelan people in this clip. Venezuela is on the Brink of Collapse and this documentary does justice in explaining what is going on in full detail via Al Jazeera.